All day I've been awash in articles and postings about Aaron Swartz's death. 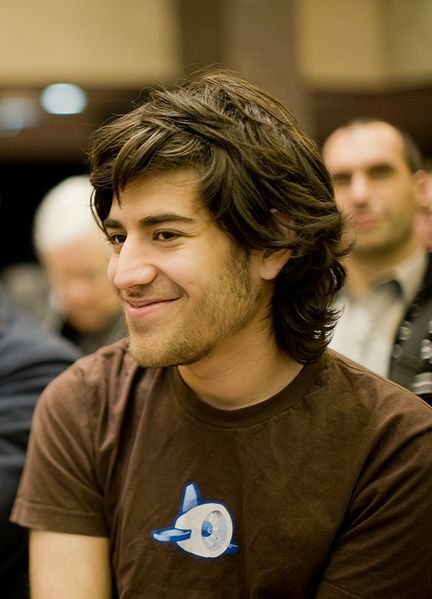 If you haven't heard of Aaron Swartz until now, you're probably not alone. Too often we only learn about great and interesting people after they're gone. If you're subscribed to this blog -- or any blog -- you're benefiting from Aaron's work. At the age of 14, Aaron helped create the original specification for RSS, the code that makes things like Google Reader and podcasting work. This blog is also licensed with a Creative Commons license, and Aaron helped with some of the code that makes CC licenses machine-readable. Aaron was also a pioneer blogger, a co-creator of Reddit, Markdown designer, Wikipedia editor, and more. But perhaps most importantly, and now tragically, Aaron was passionate about the freedom of information. Open access to research is something I've written about before (e.g., "Open Access Publishing in Mathematics Education" and "The Publication Paradox"), and Aaron's passing serves as a reminder that I should be doing even more to expose the results of academic research to the wider public. A little backstory: Aaron's "hacktivism" got the attention of the FBI in 2009 when he downloaded 18 million public legal documents which were then posted to the web. While the documents themselves were public, the government website typically charged 8 cents per page as an access fee -- fees that add up to tens of millions of dollars annually for the federal judiciary. Aaron had worked around the paywall by installing a Perl script on a computer in a public library that was exempt from the fees. The script didn't really "hack" in an illegal way, but it made the gathering of documents faster than Aaron could accomplish clicking around with the mouse. Okay, a lot faster. Aaron was investigated, but no charges were made. In January of 2011 Aaron found himself in a similar situation. By planting a laptop in a utility closet at MIT, he used a set of scripts to download over 4 million academic articles from JSTOR. Unlike the prior incident, many of those articles weren't in the public domain. Prosecutors alleged that Aaron intended to release all the articles to the public, a conclusion they may have reached after reading Aaron's Guerilla Open Access Manifesto. Perhaps Aaron was only going to release the JSTOR content that was in the public domain, which JSTOR did themselves in September 2011. Although Aaron returned the articles and JSTOR and MIT backed down from the case, federal prosecutors pushed on. He was eventually charged with 13 felonies, ranging from wire fraud, computer fraud, and recklessly damaging a protected computer. The indictment said Aaron stole and did thousands of dollars worth of damage; David Segal of Demand Progress (which Aaron founded) said "it's like trying to put someone in jail for allegedly checking too many books out of the library." Aaron was facing a million-dollar trial which, if he lost and received the maximum penalties, might have sent him to prison for 35 years. For an activist prone to bouts of severe depression, this must have been very difficult to face. We can only speculate all the reasons Aaron decided to take his own life, but Aaron's family and partner blame the overreach of the justice system for his death. Nonetheless, if the facts are true, even if the law is not clear, I, of course, believe the behavior is ethically wrong. I am a big supporter of changing the law. As my repeated injunctions against illegal file sharing attest, however, I am not a believer in breaking bad laws. I am not even convinced that laws that protect entities like JSTOR are bad. And even if sometimes civil disobedience is appropriate, even then the disobedient disobeys the law and accepts the punishment. My individual ability to change laws is limited, but I try to help the cause by informing others of open access issues, taking pledges like The Cost of Knowledge, and making (admittedly small) monetary contributions to organizations like the Electronic Frontier Foundation, Creative Commons, Wikimedia, the Free Software Foundation, and Rootstrikers. My ability to help make information publicly available, however, is less limited. The express purpose of my "Research You Should Know" (RYSK) series is to unlock some of the knowledge that I find in academic publications. As much as I'd like to just copy and paste big chunks of articles, I have a better-than-average knowledge of copyright and fair use that keeps me from doing so. Instead, I take the slow road, summarizing articles and putting things in my own words. I have some ideas for how to scale this effort, but it would take the help of others and I don't think the time and conditions are right just yet. So, for now, I'll try to keep doing what Aaron Swartz wanted to do, only I'll do it one summarized article at a time. Aaron had powerful, deeply felt ideals, but he was also always an impressionable young man, someone who often found himself moved by new passions. He always seemed somehow in search of mentors, and none of those mentors ever seemed to match the impossible standards he held them (and himself) to. If there is a sin in the open world it is locking up the public domain. Aaron took selfless action. Shame on all of us, and shame on me, at least in this way: When Aaron was indicted, I didn’t do nearly enough to help. Some, like Larry Lessig, tried hard. Most of us, if we did anything, tweeted our outrage, sent emails of moral support, and went on with our lives. In September 2008, I criticized Aaron <http://goo.gl/kaczl> for recommending illegal tactics in his Guerilla Open Access Manifesto <http://goo.gl/HKxjd>. But that didn't stop us from meeting in Cambridge (post-manifesto, pre-arrest) for a friendly coffee and catch-up. If my public criticism was a break, it didn't feel like one. We had a very enjoyable, very intense, very long conversation about our home town, open access, my repository project, and a few other geeky common interests. When he was arrested in July 2011 for mass-downloading JSTOR articles from MIT <http://goo.gl/pPkLC>, and carrying out some of the steps he urged in his manifesto, I had nothing new to say <http://goo.gl/DvYHL>. I could not join those who praised his action, and I didn't want to pile on by repeating a criticism I'd already made public. I was sad that this whip-smart, forward-thinking guy took that turn and now faced prison. I'm sad now for a much bigger reason. I worry that Swartz’s prosecution is a sign that America is gradually losing the sense of humor that has made it the home of the world’s innovators and misfits. A generation ago, we hailed Pentagon Papers leaker Daniel Ellsberg as a hero. Today, our government throws the book at whistleblowers for leaking much less consequential information. Audrey Watters wrote at her blog, "I scribbled a tear-stained note yesterday as I thought of all we've lost: 'Revolutionaries burn at a heat that is often not sustainable for the human heart.'" A solid update from the NYT, "A Data Crusader, a Defendant and Now, a Cause"
Aaron knew life would always be unfair, but that was no reason not to try to make society better. He had no illusions about power but maintained hope for our society if, I suppose, not always for himself. This is a very difficult way to approach the world, but it’s why he was so heroic in how he acted. I want people to understand that Aaron sought not open information systems, but justice. Aaron believed passionately in the scientific method as a guide for organizing our society, and in that open-minded but powerful critique, he was a technocratic liberal. His leanings sometimes moved him towards more radical postures because he recognized that our governing institutions had become malevolent, but he was not an anarchist.